The jubilee edition of Robeco Summernights starts on 30 June. To honour this, Robeco CEO Gilbert Van Hassel sounds the gong. 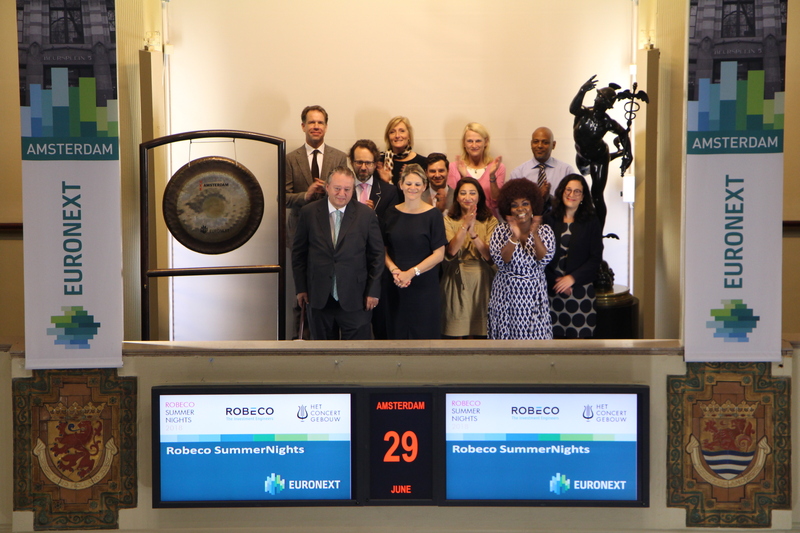 The collaboration between Robeco and The Royal Concertgebouw on Robeco SummerNights is set to begin its 30th edition. This jubilee season starts on Saturday 30 June with an extra festive opening concert with singers Laura Mvula and Gretchen Parlato and the Radio Philharmonic Orchestra. During Robeco SummerNights, which this year will be held between 30 June and 31 August, audiences can enjoy over 80 concerts in The Concertgebouw in the classical, pop, jazz and world music genres. The music ranges from Star Wars – Live in Concert, which will be an exclusive part of the summer series in the next three years, to super talent violinist Noa Wildschut and impressive youth orchestras such as the European Union Youth Orchestra and the South-African MIAGI Youth Orchestra. AUM Invest is an independent management company that specialises in investing in stocks according to a process of proprietary scoring which relies on the systematic selection of high-quality companies and a structuring approach to risk. Founded in 2016 by Emmanuel Morano and the Swiss independent multi-family office 1788Capital, AUM Invest today offers a gamut of equity funds (US, Europe and Emerging) aimed at institutional investors and Wealth management professionals. Peter Nederlof, CEO at Keijser Capital N.V., sounds the gong in Amsterdam. This year Keijser Capital celebrates their 115th anniversary as an independent, financial advisory Group. Keijser Capital NV is an experienced advisor for both family and SME-businesses that, in addition to bank financing, require growth financing, refinancing options and financing solutions. Their independent status means that a balanced advice can be given. Keijser is involved in many initiatives for alternative SME financing. The last few years Keijser established a position as an important SME finance boutique and developed a dedicated SME Bond structure. It will continue to develop its capacity as financial advisor to both Family owned as well as to SME companies offering bespoke financial solutions. 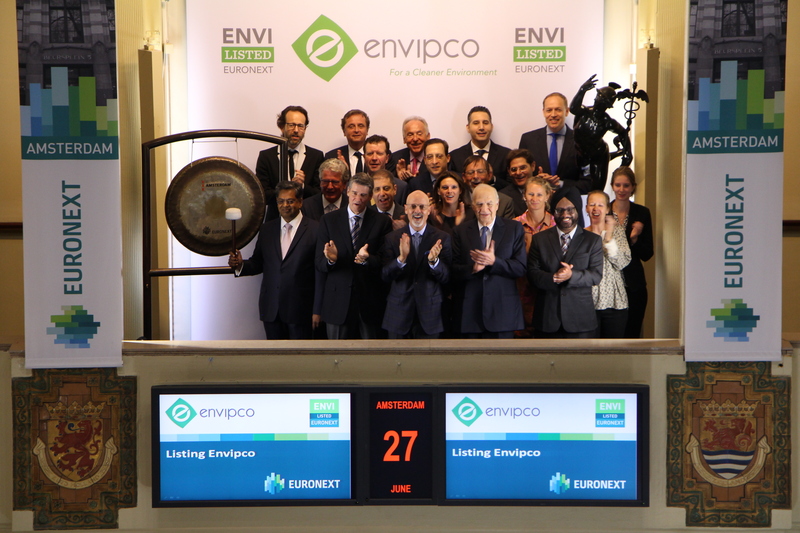 Envipco, a leading global provider of recycling systems and Reverse Vending Machine technology, will be listed at Euronext Amsterdam (ticker symbol: ENVI). Gool Santchurn, CEO of Envipco, sounds the gong to celebrate this event. Envipco plays a key role in end-to-end beverage container recycling. Its systems and solutions provide a cost-effective way of capturing containers. By making recycling easier, convenient and rewarding, Envipco hopes to make this simple act second nature. Envipco operates in a number of countries around the globe, holding the no. 2 position in the established North American market. The AkzoNobel Art Foundation celebrates the opening of the ‘Common Ground’ exhibition in the AkzoNobel Art Space with a sounding of the gong by Thierry VanLancker, CEO AkzoNobel and Chairman of the Executive Board of the AkzoNobel Art Foundation, and Hester Alberdingk Thijm, Director AkzoNobel Art Foundation. Recently the freely accessible exhibition 'Common Ground' was opened in the Art Space on the ground floor of the AkzoNobel Center on the Amsterdam Zuidas. The exhibition is about places where people meet, where people communicate with each other and how these places are represented and interpreted in art. "We at AkzoNobel not only have a passion for paint, we are also passionate about art, so I am proud to be involved in the opening of this new exhibition," said CEO Thierry Vanlancker. 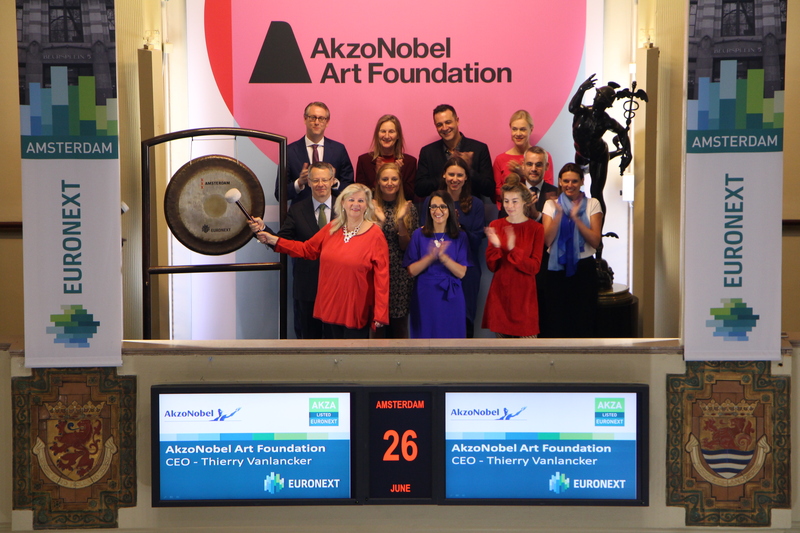 "Art has a powerful ability to create a common ground, and the AkzoNobel Art Space plays an important role in connecting the creative and business side of the company with society," he added. 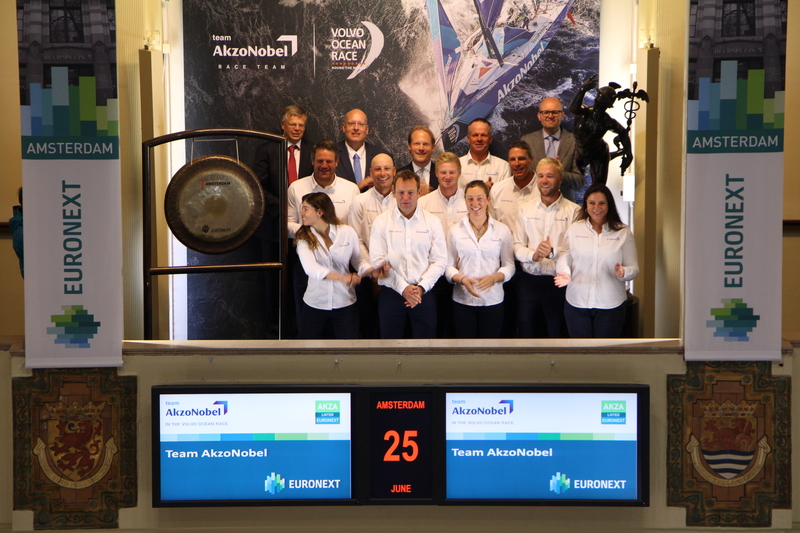 Martine Grael of Team AkzoNobel sounds the gong on the Amsterdam stock exchange of Euronext. Team AkzoNobel recently completed the Volvo Ocean Race with a finish in the Hague. Team AkzoNobel is a professional ocean racing team competing in the 2017-18 edition of the Volvo Ocean Race around the world. The team is owned and managed by leading global paints and coatings company AkzoNobel (ticker symbol: AKZA) and is crewed by an international team of professional offshore sailors including Olympic Gold medallist and Volvo Ocean Race rookie Martine Grael (BRA), five times competitor and multiple World Champion Chris Nicholson (AUS), two-times America’s Cup winner Simeon Tienpont (NED) as skipper and one of the world’s best racing navigators Jules Salter (GBR). During the 2017-18 race, team AkzoNobel broke three records including being the fastest ever boat in the Volvo Ocean Race over a 24-hour period, racking up an impressive 1,115 nautical miles as they raced across the Atlantic from Newport, RI to Cardiff, Wales. 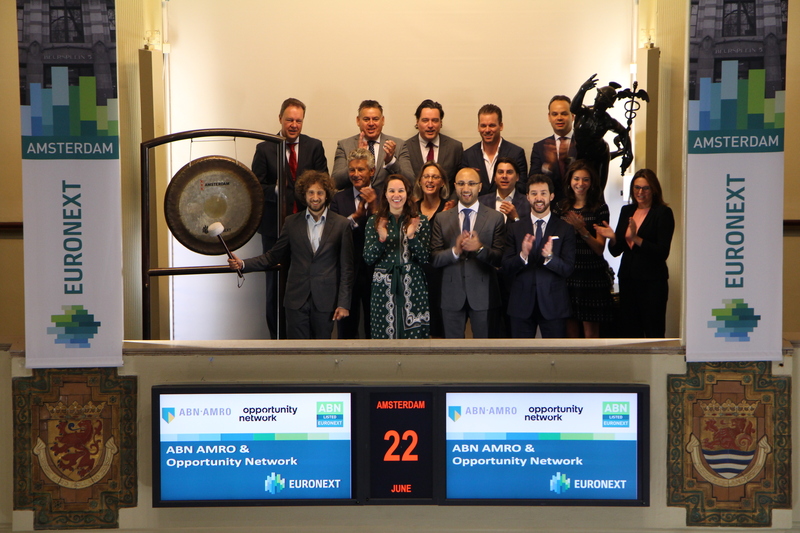 ABN AMRO (ticker symbol: ABN) opens the trading day to celebrate the strategic partnership with Opportunity Network. Brian Pallas, CEO Opportunity Network, sounds the gong on the Amsterdam exchange of Euronext. Opportunity Network gives CEOs and their teams real-time access to domestic and international opportunities at all stages of the business cycle, such as growth, expansion or sale. Clients visiting the platform can post their opportunities and are given the chance to close deals with connections made on the platform. ABN AMRO is the first player in the Netherlands to provide access to this exclusive network of by now over 14,000 CEOs. Brian Pallas, Opportunity Network's CEO, says: "We work closely with banks that put their clients' success centre stage, and ABN AMRO perfectly matches this profile. This partnership enables thousands of companies to get in touch with each other." Daphne de Kluis, CEO of Commercial Banking, comments: "By teaming up with Opportunity Network, we're able to offer extra service and support to help entrepreneurs achieve their ambitions. This also facilitates the dialogue between clients and bank about future business plans." 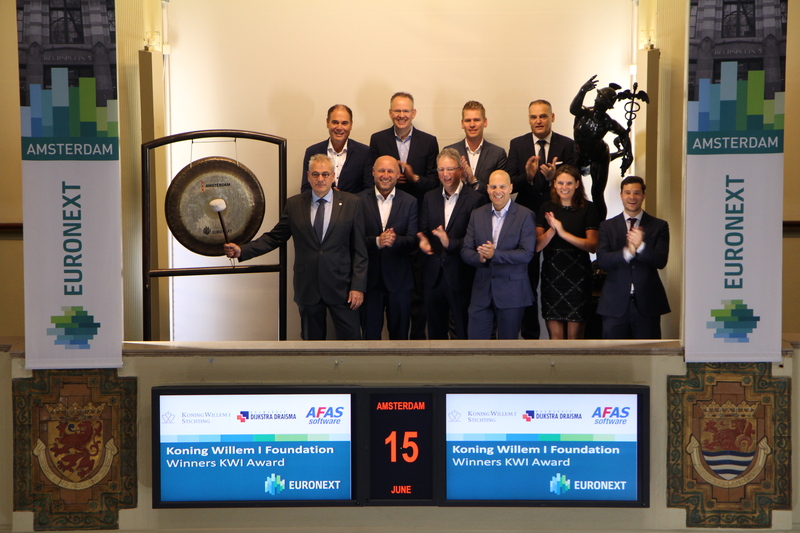 The trading day will be opened by Stofwisselkracht Foundation, Team Axel and Team Euronext to draw attention to the Stofwisseltour 2018. The gong will be sounded by Prof. Dr. Henk Blom, chairman of the medical board of Stofwisselkracht Foundation. Team Axel visited the Amsterdam exchange in 2015 and Axel's presence made a big impression on Euronext employees. 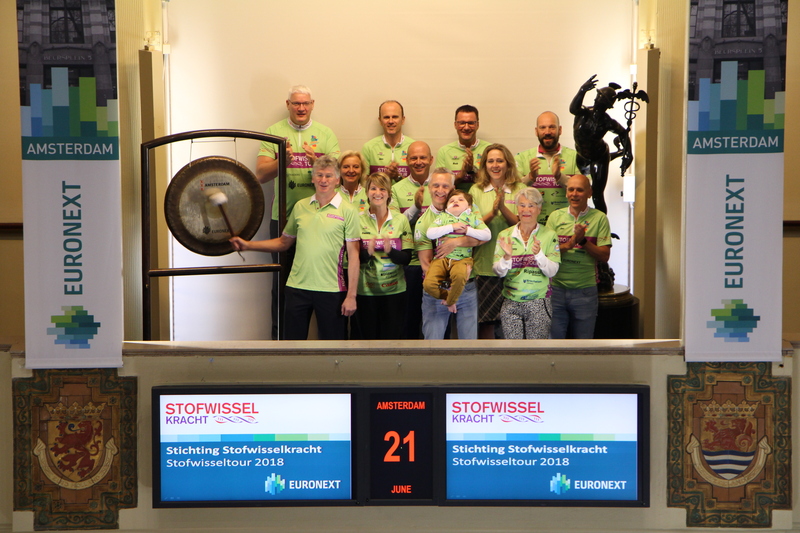 That is why, this year, they will again cycle in the Stofwisseltour under the name 'Euronext for Team Axel'. The Stofwisseltour takes place from 22 to 24 June in the form of a relay along Dutch academic hospitals. During the Stofwisseltour more than 230 participants collect as much money as possible for research, with the aim of a future without metabolic diseases. Stofwisselkracht Foundation raises funds for research into metabolic diseases through sporting events and various activities. Stofwisselkracht Foundation, organizer of the Stofwisseltour, hopes for a successful tour and a good turnout to be able to honor all incoming subsidy applications for research. 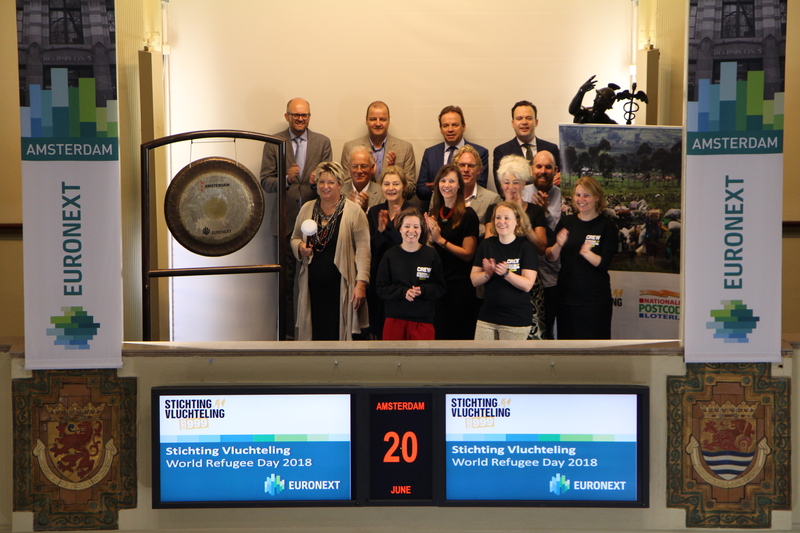 On World Refugee Day, Stichting Vluchteling (Refugee foundation) opens the Euronext Amsterdam exchange with a sounding of the gong. Stichting Vluchteling is an emergency aid organization that provides assistance to refugees and displaced persons around the world. In case of acute emergency they offer life-saving emergency aid, such as shelter, medical care, food and clean drinking water. But people can also count on the foundation for long-term humanitarian crises, for example for education and psychosocial support for the treatment of traumatic experiences. In 2001 the United Nations proclaimed June 20 the World Refugee Day. Worldwide there is then attention for the fate of refugees. ING (ticker symbol: INGA) sounds the gong on the Amsterdam exchange. Together with the opening of the trading day, the gong also marks the opening of the ING International Conference of Control Officers. For two days, managers and specialists in the field of Internal Control gather from all over the world, from New York to Singapore, from Sydney to Katowice, but also from Amsterdam. This is the third international conference with this subject. ING employees meet annually to share experiences, discuss new developments and strengthen the global network. The gong is sounded by one of the Control Officers who are working worldwide on a daily basis to ensure that ING has reliable processes and is worthy of customer trust. In doing so, they contribute to ING's goal to empower people to stay a step ahead in life and business. Cogelec is specialized in the production and marketing of interphones and control systems for collective housing (social or private). The company offers, under the Hexact and Intratone brands, interphones that enable the visitor to be heard and, sometimes, seen on a phone or any other electronic devices. It also insures secure access control solutions (electronic locks and badges) to allow entry to residents and service providers such as post office, and to prevent unauthorized people from entering foyers of buildings. RTL Z sounds gong for "Ondernemersshow"
On July 3rd, RTL Z’s De Ondernemersshow (The Entrepreneur Show) takes place in Amsterdam. The event is being organised with AFAS Software en Buro van Oranje. Comedian Guido Weijers and various experts and top entrepreneurs give their vision on successful entrepreneurship during this event. More profit, happy customers, more creativity and innovation, more peace? The Ondernemersshow brings together various speakers and entrepreneurs on one platform to answer those questions. Along with comedian Guido Weijers, customer expert Jos Burgers, brain expert Margriet Sitskoorn, PR entrepreneur José Woldring, BALR founder Juul Manders, DJ Julian Jordan and CEO of AFAS Software Bas van der Veldt. Euronext Paris rings the bell to mark its 30th anniversary. The CAC 40®, the flagship index of Euronext Paris, has been serving listed companies, investors and product issuers alike for 30 years. The CAC 40® is Euronext’s most traded index today, and is a reference benchmark for millions of institutional and retail investors. This national index has a diversified sectorial coverage, close to 6,000 associated products (ETF, warrants, certificates, derivatives), and attracts 2,203 French and international institutional investors from 66 countries. The CAC 40® is also a strong visibility and growth tool for French listed companies. Gong for the "Koning Willem 1 Award"
The winners of the Koning Willem 1 Award open the Amsterdam exchange. AFAS Software and Bouwgroep Dijkstra Draisma B.V. recently received this prestigious award. On May 28, 2018, the prizes were awarded during the official ceremony by state secretary Mona Keijzer and chairman of the Koning Willem I Foundation Klaas Knot. Since 1958 the foundation has awarded the Koning Willem I Award every two years. AFAS Software (large) supports companies and organizations from all branches in the automation process through a complete and modern (online) business software. They also help consumers get their personal money matters in order. Bouwgroep Dijkstra Draisma B.V. (SME) is a Frisian contracting company that exhibits more than 110 years of building experience. From two locations - Bolsward and Dokkum - the company mainly focuses on projects in the three northern provinces (including the Wadden Islands), North Holland and the Noordoostpolder. The gong is sounded by Robin Misdorp, Brand Builder OLA Ice Cream. 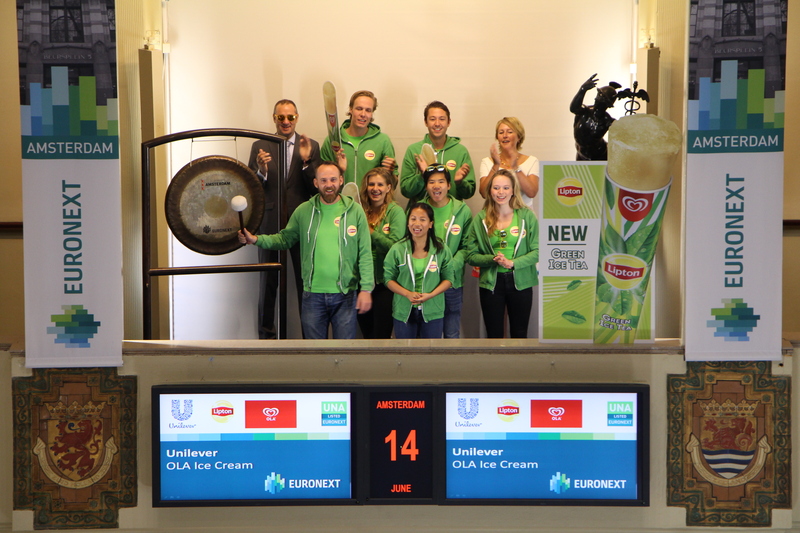 Thereby OLA, part of Unilever (ticker symbol: UNA), celebrates the launch of the new Lipton Ice Tea Green water ice cream. The OLA-brand is part of Unilever's ‘Heartbrand family’ of ice creams. The heart-logo was created in 1997 and is sold in more than 50 countries around the world under many different local names, including Wall’s, Algida and Langnese. OLA is well known from the popular ice cream brands Magnum, Cornetto, Calippo, Festini and the Rocket. 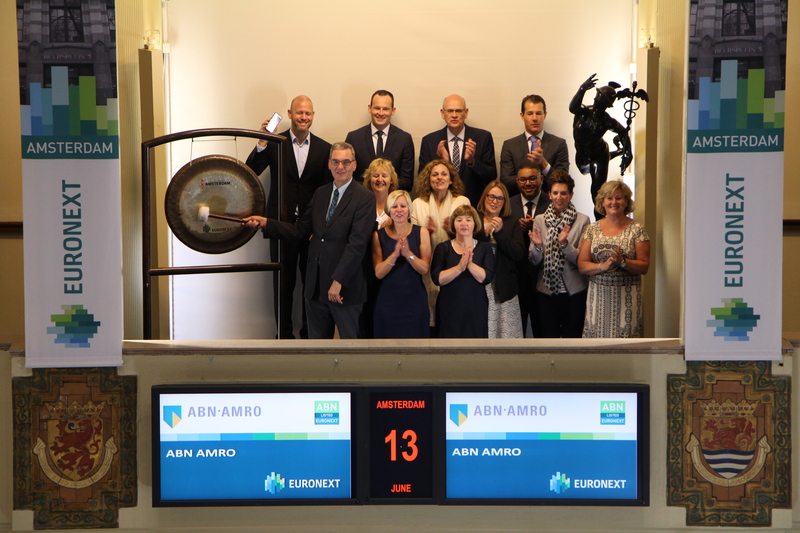 ABN AMRO opens the trading day at the Amsterdam Stock Exchange to celebrate the start of their ‘Welkom bij Begeleid Beleggen'(Welcome to Guided Investment) campaign. Last year ABN AMRO renewed the investment in profile funds, from advice product to execution only. ABN AMRO will now bring this renewed guided investment product to the attention of a larger audience. Simultaneously with the start of the campaign, a survey of investmentmatch.nl revealed that guided investment provided the highest returns on average over the past 3, 5 and 7 years. The Guided Investment campaign is primarily an online campaign. The campaign uses advertisements on websites, social media, the bank's own website, e-mail and bank mail. You can also come across commercials on the radio. With guided investments, customers in internet banking can indicate which target amount they want to achieve, how much and how long they want to invest. Dennis de Vreede has been appointed as CFO of Wereldhave recently. On this occasion he sounds the gong in the presence of Wereldhave’s local financial teams. 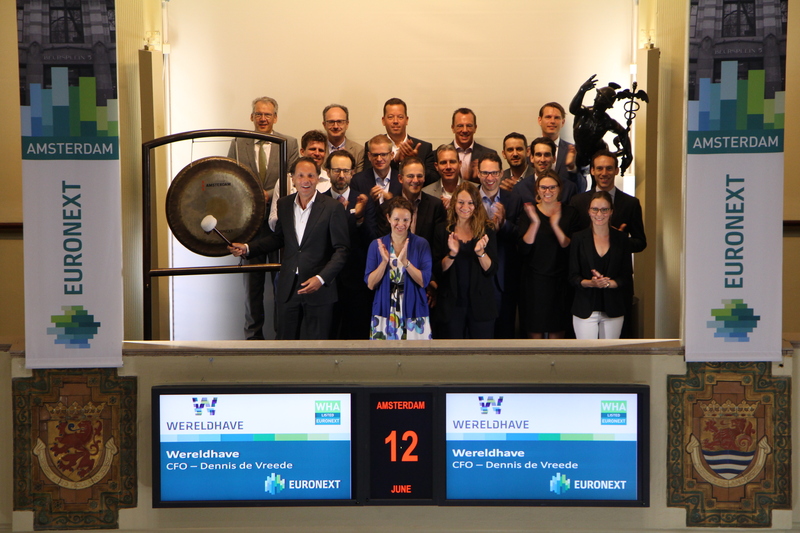 Wereldhave (ticker symbol: WHA) invests in dominant convenience shopping centres in larger provincial cities in northwest continental Europe. The area surrounding their centres include at least 100,000 inhabitants within 10 minutes’ travel time. Wereldhave focuses on shopping centres that strike a balance between convenience and shopping experience. The focus lies on products that cover all the daily shopping needs, a successful mix of international and local retail products and strong food anchor stores. 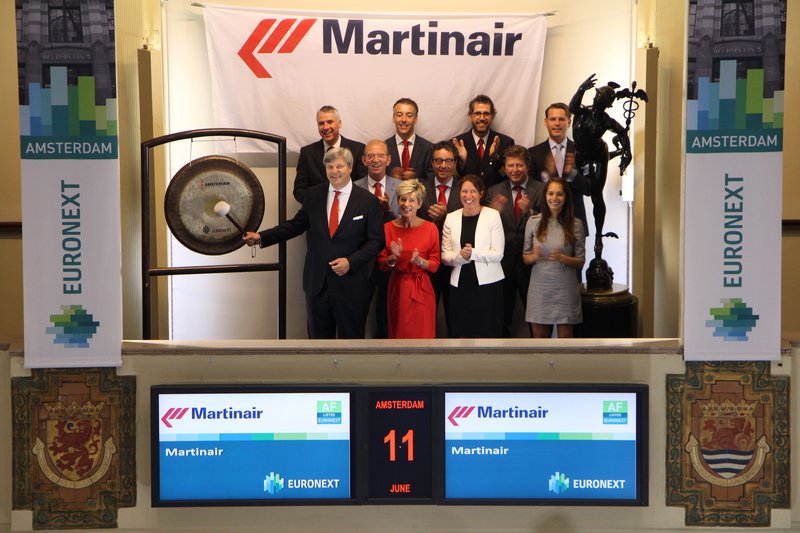 Martinair celebrates its 60th anniversary this year by sounding the gong. Marcel de Nooijer, Managing Director of Martinair Holland N.V., opens the trading day at the Amsterdam exchange of Euronext. Martinair Holland N.V. was established on May 24, 1958 and today forms part of the KLM Group (ticker symbol: AF). Martinair Holland N.V. operates three core businesses: airfreight carrier Martinair Cargo, pilot training centre Martinair Flight Academy and the maintenance, repair & overhaul company Regional Jet Center. KLM became the sole shareholder of Martinair Holland N.V. with effect from December 31, 2008. After more than 50 years, Martinair terminated its passenger operations at the end of 2011 and has since focused solely on its airfreight business. 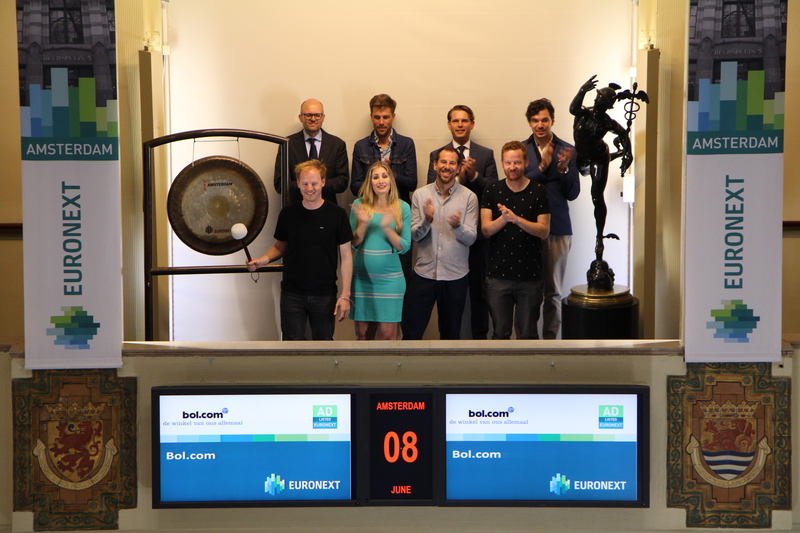 The social hub team of Bol.com sounds the gong on the Amsterdam exchange of Euronext. With this, the web shop celebrates winning two Best Social Awards. 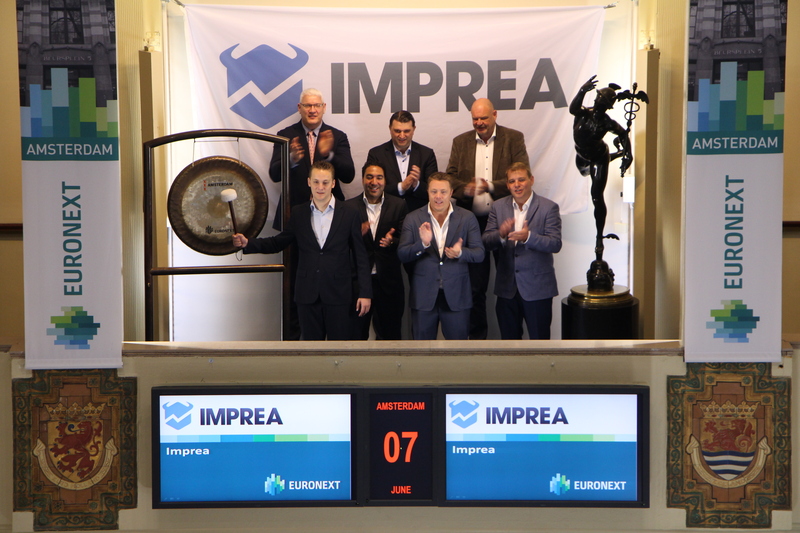 CEO Roel Janssen sounds the gong for the launch of a new social trading app, Imprea. Imprea is an internal startup from TradersOnly, a Dutch online broker for active traders. Imprea is a user-friendly social trading app which enables traders to easily trade on the markets, follow other traders and receive real-time notifications on their smartphone when other traders make trades. The trader can then decide for himself whether to copy the transaction or not. This way the trader remains in full control over his investments and decides which trades to follow. Prof. Dr. Pieter Doevendans - Director Netherlands Heart Institute and participant in Monstertour opens the Amsterdam stock exchange to mark the start of the trading day. With a sounding of the gong the PLN Foundation asks attention for the Monstertour; 543 kilometres of biking in Norway in one day. By doing this cardiologists from The Netherlands are asking for attention and donations for the heart muscle disease PLN; a rare genetic disease that is prevalent in The Netherlands. PLN gene patients are affected with heart failure or heart rhythm problems that can result in (sudden) death. 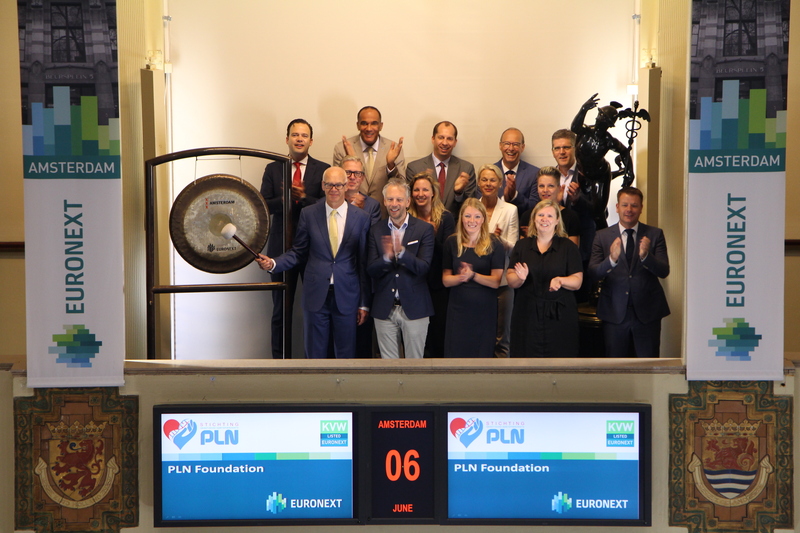 Euronext listed VolkerWessels (ticker symbol: KVW) is sponsor of the PLN Foundation. VolkerWessels is a Dutch company that is involved in many different industries. The industries in which VolkerWessels is active are construction, real estate, civil engineering, road- and railway construction and energy and telecommunications.